Celebrate Chinese New Year with Hamleys Toy Store! To mark Chinese New Year, which is on the 16th February, Hamley the Bear will be making his way over to China Town, London! He’s handing out 10% off Hamleys coupons and extra special lucky red envelopes between 15th and 18th February. Following the opening of Hamleys’ largest store in Beijing just before Christmas, Hamleys is continuing the Chinese celebrations with some amazing offers in store. Not only will there be fantastic offers on lots of toys but Hamley Bear will be dusting off his favourite changshan for the occasion. Make sure you catch him in London’s China Town during the festivities for a selfie, high fives, a 10% off discount coupon and your chance to claim a lucky red envelope. 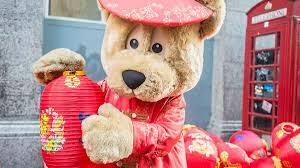 Plus, Hamley Bear and the Hamleys entertainers will be in China Town from 12 noon each day. Hamleys wouldn’t be honouring Chinese New Year right, if Hamleys didn’t celebrate 2018 as the Year of the Dog, sure to bring success and fortune to all! So, make sure you head down to your local Hamleys to enjoy 20% off selected plush dogs including the Dachshund, Westie and Pink Poodle for a limited time only between 8th – 18th February. « Learn to be a Knight this February half term!